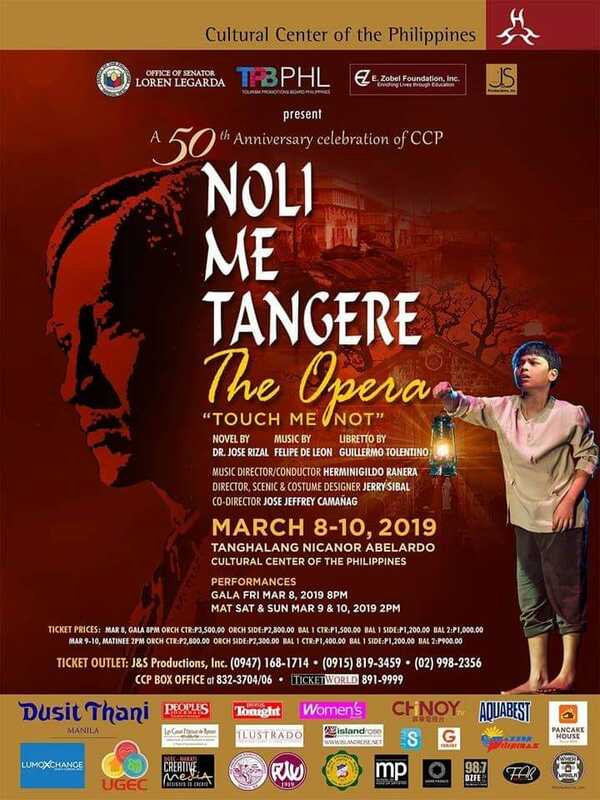 The Philippines' first full-length opera, National Artists Guillermo Tolentino and Felipe Padilla De Leon's most beloved 1957 opera, Noli Me Tangere (Huwag Mo Salangin/ Touch Me Not) returns to the Cultural Center of the Philippines' (CCP) main theatre, Tanghalang Nicanor Abelardo, from March 8-10, 2019. Co-directed by New York-based event stylist Jerry Sibal, who also does the set design, and veteran actor-director Jose Jeffrey Camanag, featuring the 53-piece NOLI Symphony Orchestra under the baton of Maestro Herminigildo Ranera, Noli Me Tangere, The Opera, which is based on the National Hero Dr. Jose Rizal's 1887 classic novel of the same name, tells the timeless story about love, betrayal, and hope set against a repulsive backdrop of tyranny, torture, and murder. The opera in Three Acts follows Juan Crisostomo Ibarra who returns to the Philippines after pursuing scholarly studies in Europe. He plans to open up a school and marry Maria Clara, his betrothed. However, parish priest Padre Damaso, the archenemy of the Ibarras, is out to hinder Crisostomo's plans. Noli Me Tangere depicts the abuses suffered by the native Indios at the hands of Spanish tyrants. The opera paints a clear picture of the so-called “social cancer” that illustrates the rotten system of governance, the illicit way of the church, and the unfavorable trade of the privileged class. “Expect a brand-new production of the Noli Opera. We will be using LED walls instead of mapping projections alongside physical set pieces, which create a more 'cinematic' look and feel,” says Sibal. “Although it's very expensive to mount this opera, ambitious even, we'd like this new production to be more affordable to students* (*tickets at 50 percent off, suggested by CCP) and the art enthusiasts. "Noli Me Tangere, The Opera unfolds as an elegant affair." "Jerry Sibal creates the attractive costumes and sets." March 8 (Fri.-Gala), 8 p.m.
March 9 (Sat.-Matinee), 2 p.m.
March 10 (Sun.-Matinee), 2 p.m.